Amazon.com (AMZN) blatantly defies all of my investing rules, and gets away with it every time. It drives me crazy! But instead of staying mad, we’re going to “get even” by banking some backdoor payouts the firm’s landlords dish out. 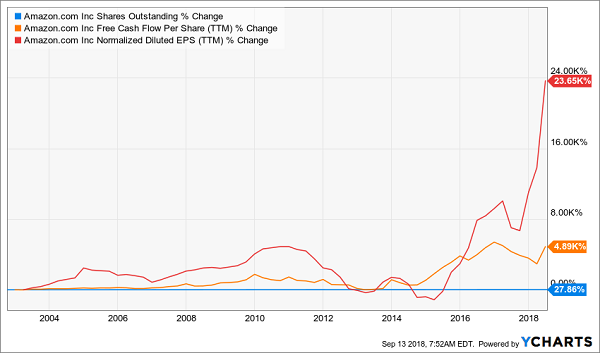 Of course Jeff Bezos’ company pays no dividend, nor does it buy back shares (and as I’ve written before, growing dividends and well-timed buybacks are sacred cows to me—and 2 keys to a rising share price). In fact, the e-commerce giant has done the opposite, thumbing its nose at repurchases—busily adding to its share count since the late ’90s! To top it off, this stock is the definition of pricey: it’s never traded below 25 times earnings in its history—and today it trades at an absurd 158 times! 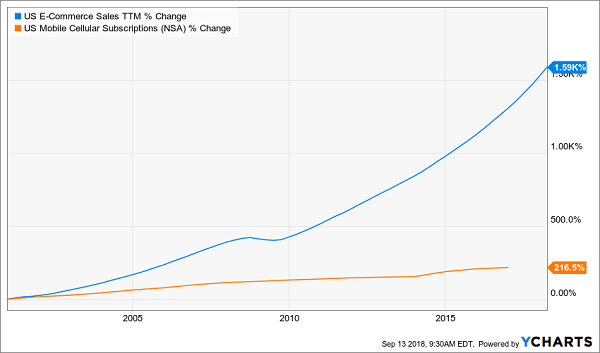 It’s infuriating for a value-focused, dividend-growth investors like us, but the numbers don’t lie: if you steered clear of Amazon, you missed one of history’s greatest stocks, with an unimaginable 101,000% gain in the since its IPO. So am I pounding the table on Amazon stock today? As much as I admire what Bezos has done here, I’m a dyed-in-the-wool dividend investor, and I still can’t make the leap. So instead, we’re going to take a different tack, tapping big cash dividends from Amazon indirectly. We’ll do it by buying smartly run high yielders that profit from the same megatrends Amazon is riding (and in many cases, the same megatrends the mavens at Amazon’s Seattle headquarters invented in the first place). Think of it as a back-door way of wringing a dividend from a company that refuses to pay us one on its own. Our first pick is about as close as you can get to doing just that. It literally is Amazon’s landlord: it rents space to the e-tail colossus and drops them straight into our accounts as dividends! I’m talking about Duke Realty (DRE), a 46-year-old real estate investment trust (REIT) with 499 warehouses in 20 markets. The e-commerce leader isn’t the only online-shopping play on that list, either. Web-based furniture retailer Wayfair.com (W)—whose revenue surged 47% in the second quarter—has a spot, too, as do brick-and-mortar plays with growing online divisions, like Home Depot (HD) and Target (TGT). And courier XPO Logistics is another strong play on the online-shopping boom. 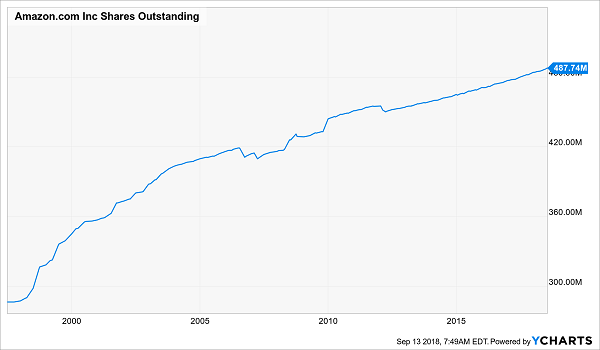 It is true that you’re only getting a 2.8% dividend yield here, but Duke has been goosing its payout in recent years and even handed shareholders a gaudy $0.85 special dividend last December, after unloading its medical-office business. This was also the second special dividend in three years—and Duke can afford another, with the regular dividend eating up just 52% of funds from operations (FFO, the REIT equivalent of earnings per share), a very low ratio for a REIT. Finally, Duke trades at 21.6-times the midpoint of management’s just-boosted 2018 FFO forecast of $1.33. 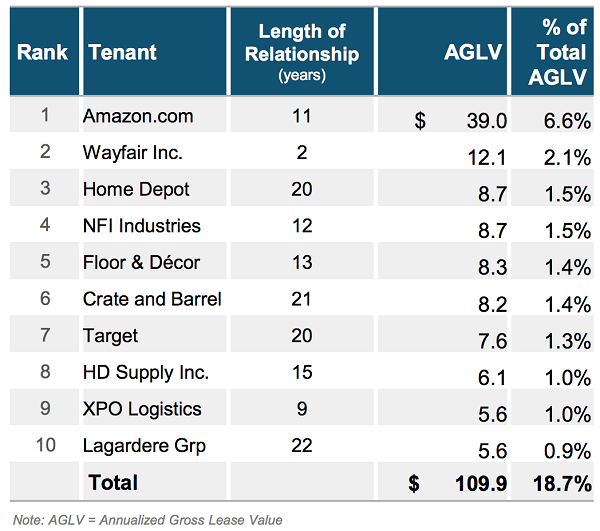 That’s still a good level for a company that truly is Amazon’s landlord—and way cheaper than buying Amazon itself! I know American Tower (AMT) doesn’t seem like an online-shopping play, but it’s a no-brainer that as we move more of our lives online (including shopping), we’ll gobble up more mobile data. Two things stand out here: first, while cell subscriptions grew more slowly, they didn’t miss a beat during the Great Recession, while e-commerce stalled out. That shows you just how durable this business is. And keep in mind that this chart just focuses on the US. 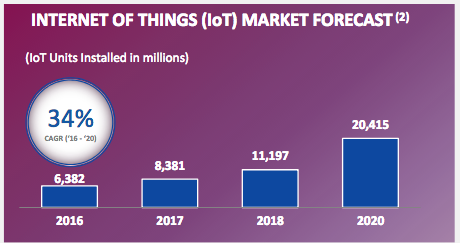 With the rollout of 5G technology, breakneck growth of the Internet of Things and ballooning middle classes in developing countries, there’s plenty of runway for AMT, which has 76% of its towers outside America’s borders. Management agrees: in fact, it’s so confident that it hikes AMT’s dividend every quarter. That’s paid off handsomely for shareholders, whose payouts have surged 182% in just the last five years. More payout growth is dialed in: AMT’s adjusted per-share FFO surged 13.1% in the second quarter, and the company sent just 39% of its last 12 months of adjusted FFO out the door as dividends—ridiculously low for a REIT. Finally, this stock’s a screaming bargain at 19.7 times the midpoint of management’s 2018 adjusted FFO forecast of $7.52 per share (which in itself is up a nice 12% from 2017). So don’t be thrown off by AMT’s meager 2.1% dividend yield. It’s a smokescreen for a company whose dividend—and share price—have lots of jump left. Now that we’ve covered bursting warehouses and soaring data use—both of which we can directly tie to Amazon—let’s get into the guts of any e-commerce setup: the places they store the computer hardware that makes it all happen. Enter Digital Realty Trust (DLR), which houses this gear for 2,300 customers at its 198 data centers across the globe. As you probably know, demand for these facilities is exploding, due in no small part to booming e-commerce. Because every online purchase, Google search or Facebook “Like” on the planet is processed through a data center somewhere. DLR buys and develops these facilities, then leases them to its clients, which include some of the biggest names in e-commerce, telecom, finance and media, including serial disrupters like Uber. The best news? You can expect another big hike this March, when DLR usually rolls out payout hikes. Because the company’s state-of-the art portfolio continues to draw in tech’s elite, which are in full-on expansion mode. That’s driving management’s bullish FFO forecast: the midpoint of its 2018 range is $7.51, up a nice 7% from 2017. But we’re not just counting on FFO to backstop our payout growth. 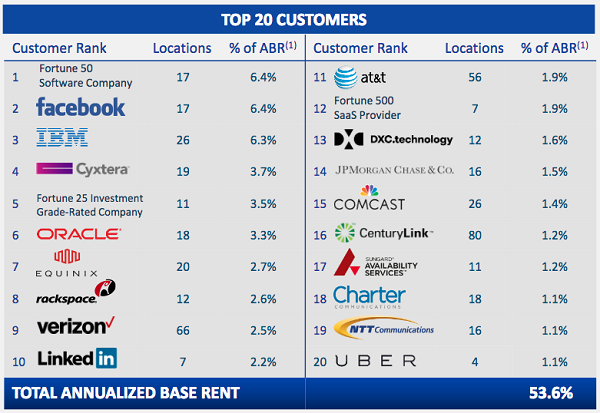 DLR also boasts a payout ratio of 61% of FFO—again, ridiculously low for REIT-land, where these ratios regularly top 80% and are still rock solid thanks to the predictable rent checks REITs collect. And here’s something else that’s ridiculously low: DLR’s valuation, at just 18.8 times the midpoint of management’s 2018 FFO estimate of $6.55 a share. That’s a steal for a company that’s riding e-commerce, data usage, cloud computing and pretty well every other tech megatrend there is. 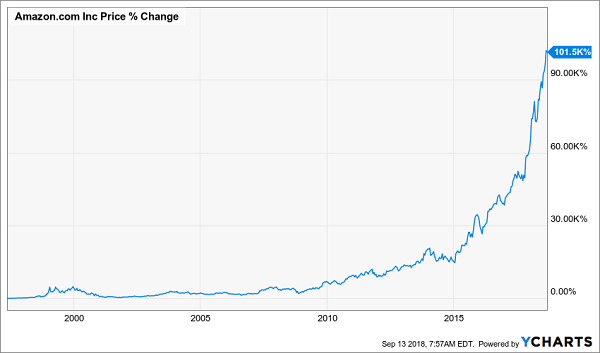 Unless you’ve got a time machine and can go back and buy Amazon 10 years ago, or even better in 1997, you’re still better off buying rapid dividend growers—especially accelerating dividends like DLR’s runaway payout. Because I know I don’t have to tell you that you can only spot megatrend winners like Amazon in hindsight. Back in 1997, if someone told you that you needed to put your nest egg in a tiny company selling books on something called the Internet, you probably would have thought they were nuts! Dividend growth, on the other hand, is a slam-dunk strategy that’s proven itself over and over and over again throughout history. Step 1. You invest a set amount of money in a “dividend accelerator” like DLR and immediately start getting regular returns on the order of 3%, 4% or maybe more. That alone is better than you can get from most other conservative investments now! Step 2. 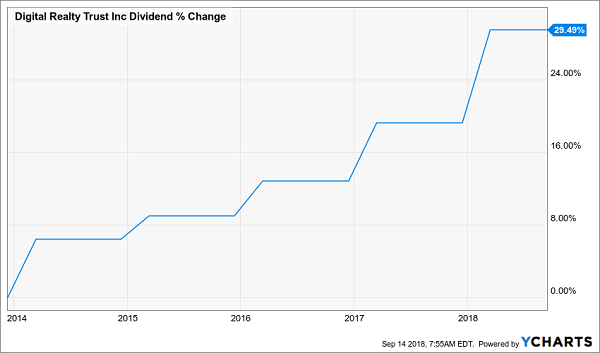 Over time, your dividend payments go up, increasing the yield on your original buy as they do—so you’re eventually earning 8%, 9% or 10% a year on your upfront investment. This combination of rising dividends and capital appreciation sets you up to earn 21.1% or more a year, on average, with almost no effort or active investing at all. So which “dividend accelerators” should you buy today? The 3 Amazon-driven winners I showed you are a great start. But you know me—I’ve got even more for you: my list of 7 “best buys,” which are locked in to rise even faster—easily (and safely) doubling your money every 3 to 5 years. If you achieve returns of 21.1%, you’ll double your money in a little over 3 years. So if you haven’t been following this strategy, why not? The best time to get started is today—before the 7 dividend growers I mentioned begin to move. Click here and I’ll share their names, tickers and buy-under prices with you now.